There are two types of operating system architecture available for Windows and Linux operating system. 32-bit and 64-bit operating system. 32-bit operating system measn it can process 32 bit of data in one CPU cycle. 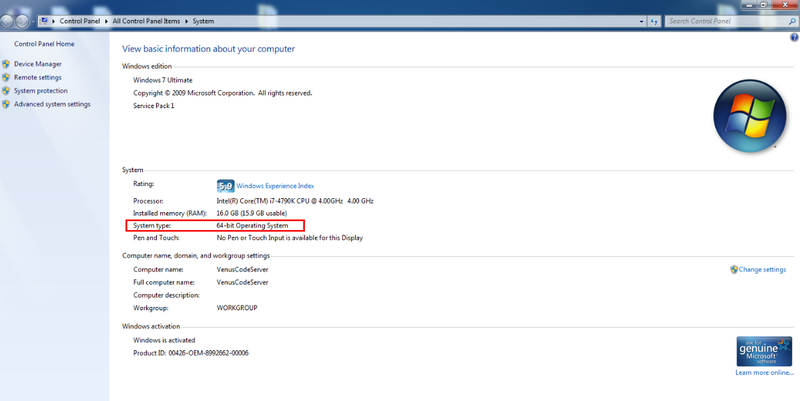 So if yo have a DUAL Core CPU with 2.0 GHz speed then it can process 119.21 GB per second. 64-bit operating system means it can process 64 bit of data in one CPU cycle. So if yo have a DUAL Core CPU with 2.0 GHz speed then it can process 238.42 GB per second. Difference is clear. A 64 bit Operating System can process 2 times more than a 32 bit Operating System. Now the obvious question is why we need a 32 bit Operating System ? Answer is straight forward. 32 bit Operating System is old Operating system supported for old CPU where architecture is designed to process 32 bit per CPU cycle. Now a day CPUs are build on top of 64 bit architecture and it require a 64 bit operating system. In some cases it is possible to install a 32 bit operating system in a 64 bit CPU but in that case 32 bit is always idea or in other words that CPU will always run with only 50% load. And you will get the result like this depends upon your operating system. Alternatively you can go right click on "My Computer" => Go to "Properties" under system block you will find "System type". This is you operating system architecture.